1 of 1 In a small bowl, whisk vinegar, mustard, salt and pepper. Gradually drizzle in the olive oil, whisking continuously until dressing is emulsified. Add chives; set aside. 1 of 3 Bring a large pot of lightly salted water to a boil. Add beans and simmer for 5 minutes or until crisp-tender. Drain and place in a large bowl. Toss with dressing; set aside. 2 of 3 Heat the 2 tablespoons oil in a large skillet over medium-high heat. Add garlic and shrimp. Season with salt and pepper and cook for about 2 minutes per side or until cooked through. 3 of 3 To serve, toss tomatoes with the beans. Place on a serving platter. 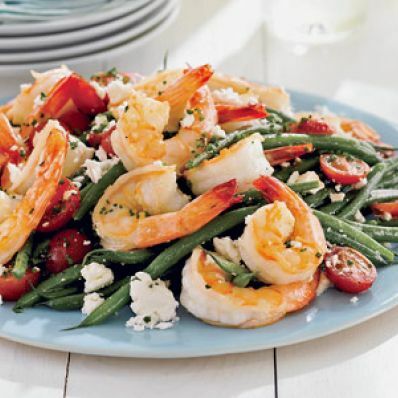 Scatter shrimp and feta over the top. Garnish with snipped chives, if desired.